It is undeniable that nature has tremendous relaxing and inspiring effects on us and I can see my clients dropping into their natural peace during the outdoor photo session. Nature invites us to connect to the beauty of the earth and to our own beauty. Nature also brings grounding qualities and enables us to fully express ourselves. It gives us a deeper sense of freedom and wellbeing that is clearly reflected on the photos I take during the outdoor sessions. I love seeing the transformation that a woman goes through during the portrait session with me! From being shy, sometimes vulnerable, perhaps lacking confidence or insecure to opening up, expressing herself, feeling free and beautiful, and having fun! 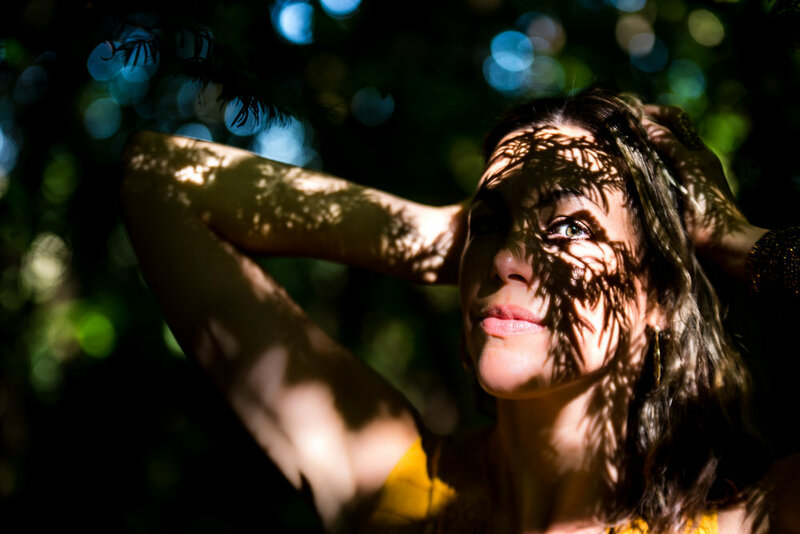 Lifestyle/ Outdoor branding photo session is perfect for holistic, yoga teachers, dancers, creative individuals, artists, coaches and for all those who wish to shine their authenticity in a natural setting. “Explosion of creativity, vibrant colours, freedom, inspiration, authenticity...” are just a few words that come to mind when describing the Outdoor Portrait Session. As a personal brand photographer, I find great inspiration in nature and thrive creatively during the outdoor & lifestyle photo session. As well as unleashing my client’s inner expression and freedom, it also gives me wings and a sense of free creative flow. I love experimenting and creating something truly unique during my professional portrait photo sessions. Together we play with the sun, the deep shadows and the shapes of the trees. For me it's all about the natural light. Soooo flattering for skin tones! The power of the outdoor photo session is also found in each season. There is beauty, mood and vibrancy of colours in each one of them. The outdoors offers a large range of backdrops for your photo session. We do not fight with weather conditions but instead take advantage of the windy, foggy or rainy day to enhance the flow of movement during the session. Outdoor surroundings, whether it’s woodland, beach, seafront, river or forest, can support you in your confidence as a woman and awaken your femininity. 1) Sandy beaches with open space give a sense of unlimited possibilities, freedom and strength. Here we can play with the water and wind elements. 2) Forest/Woodlands offer a warm and cosy feel to the images. A sense of safety and intimacy. We play with the trees, the deep shadows, the leaves...Bringing a very earthy and grounding feel to the pictures. 4) Rivers are a great way to express the feminine flow and energy in a more gentle way than the sea. We can play with the rocks, the shadows, the currents and the reflections in the water. As a Personal Brand Portrait Photographer, I see locations in a different perspective and seek the unexpected spots, quirky corners or narrow streets that will turn out to be fabulous backdrops. The common misconception is that we need sunny weather for photo shoots. Well, this is simply not true. It’s actually quite the opposite! The best images are created “before or after” the storm. The beauty and magic of the outdoor photography is that we can do it all year round! I shoot in all weather conditions, whether it is a hot summer day or cold winter day, by windy weather, under a cloudy sky or under the rain, in the mist or the fog…you name it! As a natural light portrait photographer, my favourite time of day to shoot outdoors is during the two hours after sunrise and the two hours before sunset. I just love the golden hour with its warm oranges, fiery reds, intense pinks and its soft light just a few minutes before sunset. What would be your preferred photo shoot location? Is it your favourite coffee place? Or quirky corner of the city? Sea view or city view? Woodland, field or sea?